The Vrancea area lies in the southeastern ‘corner’ of the U-shaped Carpathian range which, with its beautiful Alpine pastures and high, wooded slopes, makes up about a third of Romania. Only 130 km (81 mi) north of the capital, Bucharest, Vrancea is a seismogenic zone where most of the seismic activity which affects a large swathe of the Balkans originates. 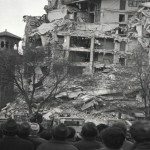 Major earthquakes have taken place regularly here for centuries, but the 7.2 magnitude quake that struck in March 1977 was the most serious, with thousands of casualties and damage as far away as the Bulgarian town of Svishtov, south of the Danube. Most badly hit was the city of Bucharest, which sustained about 90 per cent of the country’s fatalities. In the countryside around Vrancea, hundreds of low wood-framed village houses and farm buildings collapsed, but the worst architectural casualties were the city’s prewar apartment blocks and public buildings. Bucharest still has a Parisian atmosphere, with wide boulevards lined by fine, tall residential buildings, and many of these fell in the quake, though they had survived a previous one in 1940. They were constructed of reinforced concrete with brick infill – most of the modern concrete buildings, such as hotels and offices, had been constructed to withstand quakes, and remained standing. Altogether, more than 30,000 apartments were damaged or destroyed, and many of the city’s historic buildings were beyond repair. In 1997 an international workshop on the earthquakes of Vrancea was held. Attended by more than 100 seismologists and engineers from 12 countries, it resulted in invaluable co-operative work and produced recommendations on hazard prevention and risk management. Death toll: Altogether, more than 1,500 died and more than 11,000 were injured. You should know: In part of Bucharest’s historic district conveniently ‘cleared’ after the earthquake, Ceausescu began his massive, Stalinist ‘House of the People’. The second largest building in the world, it was unfinished at his death in 1989 and now houses Romania’s parliament.